Why Nintendo Should Have Party Chat | The Gamesmen- What role will YOU play? With the news of Splatoon being the most recent in the line of games not receiving online chat, it has either become clear that Nintendo knows nothing about how to set up an online structure that can support constant chat to others. They want to keep the younger generation of gamers safe from the toxicity of the internet, or they just don’t care about what the Wii U community wants to have on their console. I am going to go over some of the reasons why Nintendo should have no problem setting up a system for if not in game chat then at least party chat. The first reason why Nintendo should be able to have party chat, and is probably the biggest reason; there may not be a lot of people that even remember it exists, but Wii U Chat came built into the systems software at launch. This lets you video chat with anyone around the world just by tapping their mii and calling. This is exactly how Skype works with a web cam and because of Nintendo’s ignorance for a party chat system; I am constantly reduced to calling friends over Skype, or chatting over TeamSpeak. This is not a problem for me since my computer (or phone if that is how you use those programs) is a foot away from me, but for someone that has their Wii U in a separate room doesn’t have that luxury. The function even works while in a game, but you have to put your session on hold while in the call. If Nintendo can set it up so anyone can call a friend without video chat, and keep the call going while playing a game they will be set; they’re already over half way to achieving that. The next point to cover is that their competitors that have been doing this, and basically perfected it the last console generation. Even though voice chat on a console first showed up on the Dreamcast, the company Nintendo should take a page from is Microsoft. Launching the Xbox Live service 13 years ago and giving the Xbox 360 an edge for having an easy way for friends to have a chat while playing separately, together, and even multiplayer with strangers; this showed the gaming industry that couch co-op wasn’t the only way games could be played, and online gaming communities started to grow. Nintendo doesn’t seem to have the knack to learn from what others have been doing so well; are they trying to keep the younger audience away from online bullies and becoming one themselves? The real answer is, whats the point, children will learn from their surroundings anyway; if they are really worried all they need is a parental control and to put it on the parents shoulders to control the content their children get. The other blessing that can be used when there is an annoying person is the mute button; this cancels out the problem right there and the game can be enjoyed. When someone doesn’t want to talk to random people on the internet they can always go into a private party chat and talk to friends that way and have a good time. It is clear that there is no reason Nintendo can’t have a system put into place to expand on the Wii U chat. So with all the good that Nintendo is capable of putting into their system, they just seem ignorant to what many of people have been quite verbal about. Hopefully with DeNA helping Nintendo with their new online service they can give the insight needed to get a great service out to their community. There are a lot of good reasons Nintendo should have voice chat in Splatoon, at least in friend matches. #1 When’s the last time you heard anyone using vc for team coordination in a shooter, outside of during serious competitions that many people watch like tournaments and ranked matches? The reality is that most people that play shooters, with friends or in public lobbies with randoms, use chat more for having fun and trash-talking than anything even close to team coordination. Usually more the latter than the former, which makes vc annoying. And knowing Nintendo, if they did implement vc, they’d lack a way of muting things, which would mean you’d have to deal with the idiots if you wanted to talk to the worthwhile ones. #2 Maybe a lot of people have forgotten, but this isn’t a round of team death match, where you aim for other players exclusively and thus would benefit greatly from team chat to coordinate, to find the opponents that you can’t normally find and keep track of all at once without aid of something like a SATCOM. Your objective is the stage. Which the game pad constantly displays, as would the minimap, showing real-time data of how much of the stage your side owns. This means that everyone will be naturally coordinating their movements with their team, because they’ll all be checking their maps to see which areas need covering most, and gravitating towards them alongside their team. They won’t need to be told where to go, so voice chat for the sake of coordination isn’t as vital. 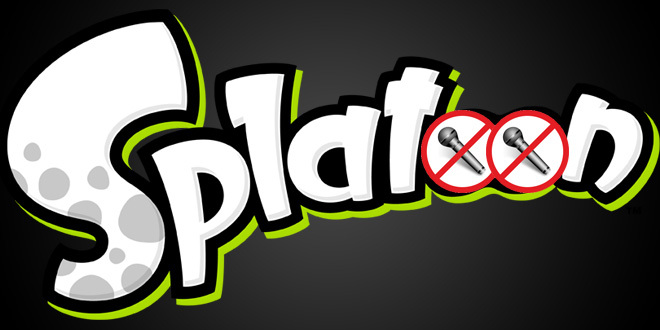 So, again, for the sake of fun and for showing that they understand what we want out of them, Nintendo DEFINITELY SHOULD include vc in Splatoon. Yeah Nintendo really don’t make it easy for people to connect. I think it’s time they looked around and realised that everybody else is striving to make it easier to communicate and feel connected, while they still seem to think it’s their responsibility to keep minors safe from online “predators” or whatever they’re concerned about. Just because its 2015 doesn’t mean every game in the world should have voice chat. If they make it available to only the people whom are willing to pay for it without adding the cost to people that won’t use it, go for it. I know I won’t be using any of those systems.